I have a decision to make that is giving the bibliophile in me a panic. My goal was to build a personal library of one thousand books. Not just any books but books I loved and books that are quality. I am close to reaching my goal. I am up to 882 books. The problem is that I was not a librarian when I made that goal. Now that I have become a librarian and have seen the inside of that world from the other side of the stacks, I am not so sure my goal is a responsible one. There are books everywhere thousands of books. The library offers books to patrons free of charge. The funds available for libraries is always in jeopardy and is something that librarians have to justify to others who may or may not love the library. Crazy I know but not everyone supports libraries. Maybe I should just donate my books and visit them at the library. The other thing is space. I am out of book space. Well I am out of legitimate book space. I could stack them up all over the house, but then I would be on an episode of hoarders in a flash. I know my family. I have not bought a book in years by browsing a bookstore. Nor do I order them for myself on Amazon.I just stay out of the stores, mostly. (Christmas gift cards excluded.) I do subscribe to Book Riots Quarterly Box. That is my gift to me for the MLIS I received in December. I won’t keep getting it forever. Actually plan to stop that after the next one. Other than that, I get all my books from the library or from friends. So, how do I balance my love of books and my desire to be a responsible librarian? That is a difficult question to answer. The bibliophile in me is like a certain little hobbit, my precious books, and doesn’t want to let them go. The grown up librarian side of me says, but you work where books are and you have access to interlibrary loan, get over it. Now that I have sufficiently whined to you about my problem, what do you think, my fellow book lovers? I read this article where someone took an old console television and did this! I found instructions here. I going to ask my husband if he wants to take on this project. If not I will have to get someone to help me just move this old thing.It is deceivingly heavy. Now I am in the look out for other things I can used for book storage. I was sort of pouting that I have run out of shelf space, when in reality I was not using my noodle, as my grandson would say. There are all sorts of things we could turn into a book holding device. 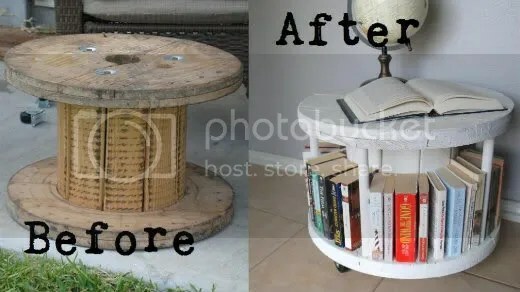 Look at this cool idea, I see books on that too, don’t you! Here is another great idea! Are you feeling book-silly inspired now? I sure am!